Taking pride in your jewellery purchases and investing in some beautiful, ethically made pieces that you'll cherish for years to come, needn't be as expensive as you may think. The latest addition to my collection is this stunning, yet simple piece from Sacet. If you think ethical jewellery looks too 'hippy' for your liking, Sacet will definitely help to change your mind! Sacet brings together a wealth of designers and talented craftspeople who are committed to transforming the designer jewellery industry by focusing on bringing a more sustainable approach to people, profits and the planet. This means that everything you purchase from Sacet is ethically and consciously crafted; the people making your jewellery are paid fairly for their work, their communities and livelihoods are supported, and all the materials used are ethically sourced. 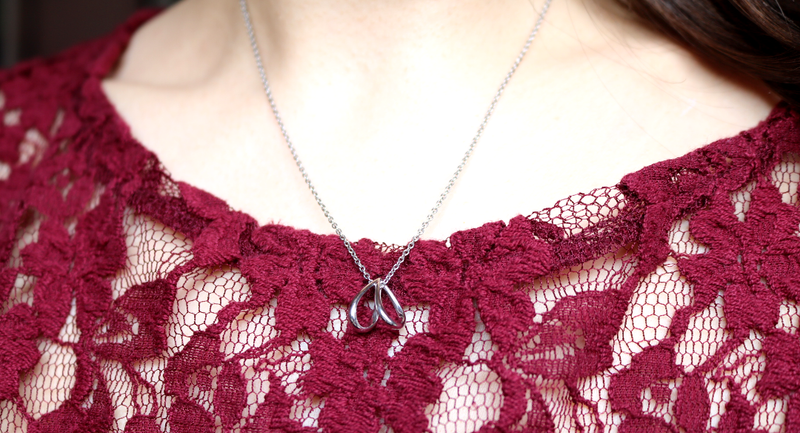 To help spread the word about what they're doing, Sacet very kindly asked me to review one of their pieces and I had the pleasure of choosing the Lujia Perched Butterfly Necklace, which immediately caught my eye when I was browsing their website. 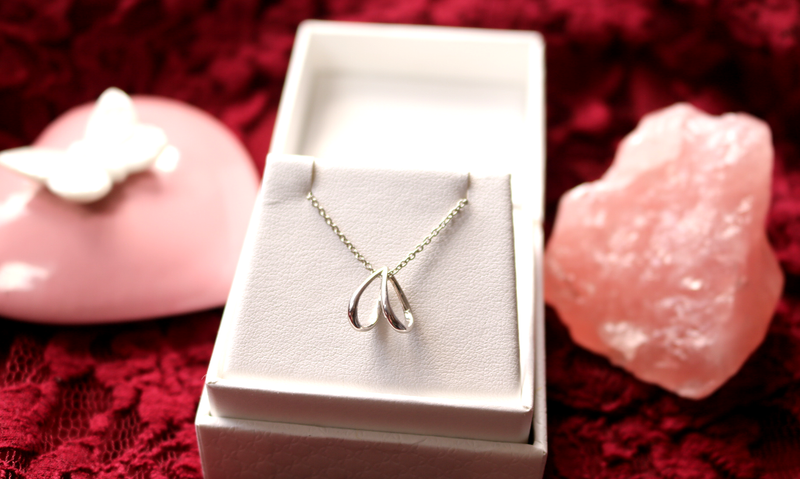 Packaged in an elegant, eco-friendly (made from recycled materials) white gift box, this necklace has been designed by Meng Zhang, a London based designer who holds a MA in Jewellery Design from the prestigious Central Saint Martins. She's won numerous awards and has been featured in Harper's Bazaar, as well as being shortlisted in a design competition for the luxury Parisian brand, Chaumet. The Lujia Perched Butterfly Necklace is a beautifully simple and timeless design which features an abstract perched butterfly on a delicate chain, or it can be turned around and presented as a classic heart. This interchanging design is something that definitely drew me to the piece because it's almost like having two necklaces in one! 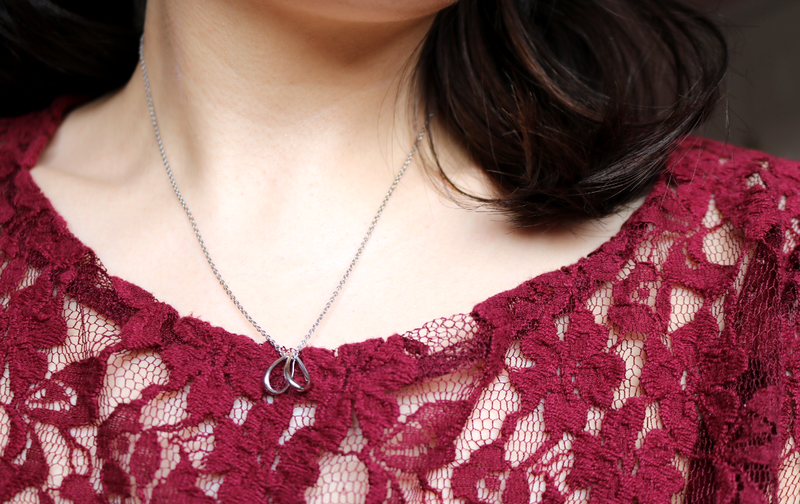 I've lost count of how many compliments I've received from friends and family since it arrived, and I love how it pairs so well with so many of my outfits, especially this vintage wine-red lace dress. Made from recycled sterling silver, this necklace is available in three different chain lengths (16, 18 or 20 inch) and comes in three colours; Silver (as shown), Gold (18k Gold Vermeil on Sterling Silver) and Rose Gold (18k Rose Gold on Sterling Silver). Have you purchased anything from Sacet?